Today is my research day, which in today's case meant some cooking and baking to fill the morning, before burying my head in some books this afternoon. I know I said in my last post that I was going to cook something that wasn't orange, but it turns out that by cleaning my fridge out and cooking with the things that need using, I ended up with another orange coloured meal. Well, at least this time it has specks of colour in it, and it is certainly bordering on red. There isn't really a recipe for this, as I just threw ingredients into a pot that I thought would go well together. They did indeed, and the result was a very thick slightly spicy bean and potato soup. If I thickened it with some cornflour I could probably call it a stew. I used some dried mixed beans that I had soaked overnight, boiled them until tender and then added one chopped potato, half a red onion, some red and yellow pepper, one Mettendchen*, 2 minced cloves of garlic, covered the whole lot with water and brought it to a simmer. For further flavouring I added some vegetable stock powder, plenty of sweet paprika, some chili powder, cumin, corriander, a bayleaf, some tomato puree, salt and freshly ground black pepper. I gave it a good stir and let it simmer until the potatoes were done. *Mettendchen are a German smoked sausage that is great in stews. I had some that I brought back from my Berlin trip, but you could just leave them out or use smoked Polish sausage. If you really don't want to cook without a recipe and need measurements, you can have a look at a very similar recipe that I have posted here. Perfect for today's miserable weather! I'd like to try this with chorizo actually, I think it would go well with the paprika. Looks very heartwarming and conforting! A perfect winter soup! there is nothing wrong with orange! This sounds delicious! Ginger, chorizo is a great idea. I'm sure you're right and it would go perfect. That looks so good! Sadly, my husband doesn't consider soup a meal, but maybe with all the sausage it might qualify! 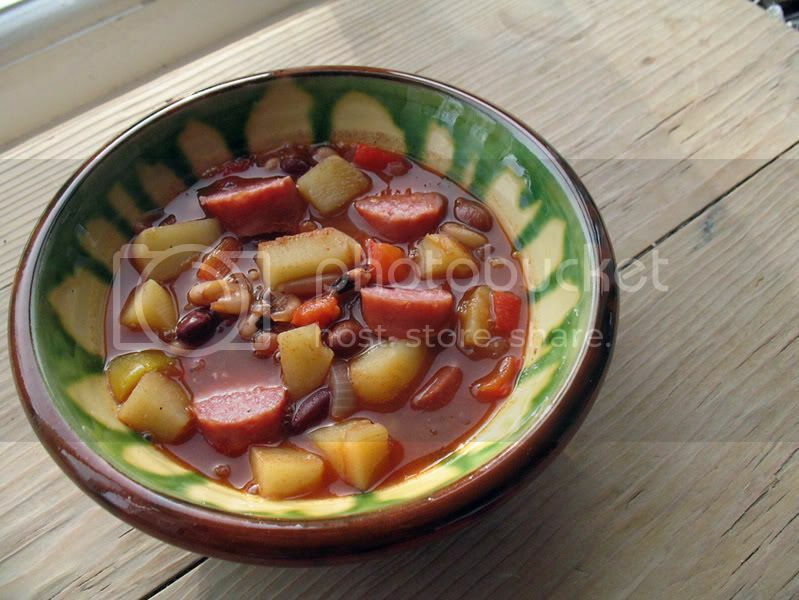 Your soup does look good Sylvie and I think the other posters idea about Chorizo would blend really well. I like it in the colder months when I can cook soups, stews and cassoroles....Comfort food at its best. biz, just add another potato and more sausage and thicken it with a little cornflour (cornstarch) and it will definitely pass as a stew. I wish I made more soup. The are so comforting and easy to make. I have to get the crockpot out again lol. Oooh now that soup looks good! Ps: Sylvie - The deleted comment was me as my comment showed up twice! There's nothing wrong with orange food! this lloks really good! What a beautiful bowl of soup - perfect for this cold weather. What a knack you have for building a beautiful dish! It looks hearty and tasty, and is making me look forward to dinner. You mentioned sausage. It reminded be of a slightly bawdy story about a German lady in America that I will share if you wish. It's cold & windy here and this soup would do just the trick. 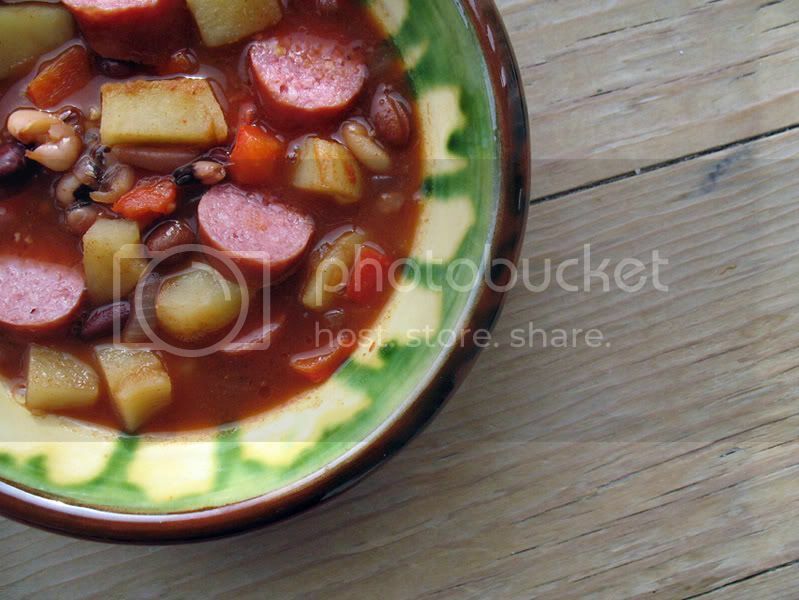 A nice and hearty soup for a cold winter day. Chuck, I've not got a crockpot anymore, but like making soups on the stove top as well. You're right they are usually really easy and I guess a crockpot makes it even less work. Jan, thanks. I hate it when technology plays up on me like that, but no worries at all! Sam, obviously I like orange food as well, I just have been having an awful lot of it lately. Peter, it's miserable here in the UK as well and you're right this was just perfect. Kevin, that was exactly what I thought too.